Illinois State alumni and Loyalty Circle members Chuck and Gwen Yurieci. Chuck Yurieci, M.S. ’72, is all about tracking the vital statistics. A fan of all sports, he taught his wife soon after their marriage in 1974 not just the rules of several games, but how to keep score. Now he and Gwen (Rogers) ’73 admit that sports dominate their life, as they easily attend an event four to five times a week and follow teams from high school to the professional level. Ironically, while recording the accomplishments of so many others on the court and field, the two lost count with their own achievement. 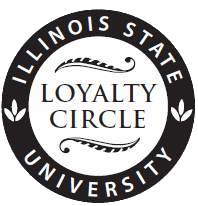 Both were surprised to learn that they have financially supported Illinois State University for 31 consecutive years, making them among the most loyal of Redbird donors in the Loyalty Circle. “We didn’t realize it had been that long,” said Chuck, who not surprisingly can trace a desire to give back to his own days as a student-athlete. He was a talented member of the Millikin football and baseball teams while completing an undergraduate degree in accounting during the late 1960s. The conference didn’t offer athletic scholarships, but Chuck did qualify for financial assistance because of his strong academic record. With his degree in hand, Chuck was able to secure a job in the finance division at what is now Growmark in Bloomington-Normal. He left after six months for active training with the Army reserve, but the company welcomed him back. He soon realized the benefit of an advanced degree and began taking night classes in Illinois State’s College of Business while advancing his career. Gwen was on the other side of the Quad studying medical records as Chuck completed his master’s. The two never crossed paths as students. Chuck was at the office during the day and Gwen was not able to participate in much campus activity because she too held a job. Like Chuck, Gwen was on a tight budget and had to work to cover the college bills. She was glad to find a place at Mennonite Hospital, which fit with her academic interests. “I was working so much that I didn’t get to socialize except through my classes,” Gwen recalled. She did live in Watterson Towers one year to enjoy residence hall life. She still vividly remembers when Doug Collins ’73 and other members of the basketball team joined her on the elevator. Chuck had an interest in ISU sports as well, in part because he had faced the Redbirds as an opponent. He still remembers coming to Hancock Stadium on the visiting team for a game in 1965 and leaving the field victorious because of a game-winning extra point he kicked. The story is just one of many sports moments Chuck shared with Gwen when the two started connected as a result of a blind date that led to their romance and marriage. Their ties to Illinois State grew stronger as a couple and through the years as they made Bloomington their home and could visit campus often. Chuck worked at Growmark for 34 years, retiring in 2002. Gwen was at OSF St. Joseph Medical Center for 33 years, entering retirement in 2007. Throughout those years they maintained their connection to Athletics, faithfully cheering the Redbirds and investing in the program so that student-athletes could have the thrill of competition that Chuck so enjoyed in college. “I want students to have the opportunity to participate in sports. The team experience is like nothing else,” Chuck said. They also donate to their colleges, Friends of the Arts, and the Illinois Shakespeare Festival. Their record of giving is motivated by their own collegiate experience. “You realize as an adult that there is no free lunch,” Chuck said, explaining his gratitude for the investment others made that allowed him to pursue his college dreams. “There is always a need,” Gwen added, noting students today carry an even heavier burden in trying to cover college expenses that have skyrocketed since the 1970s. Their amazing dedication allows programs to flourish and enables students to not just attend Illinois State but actively engage in Redbird life.